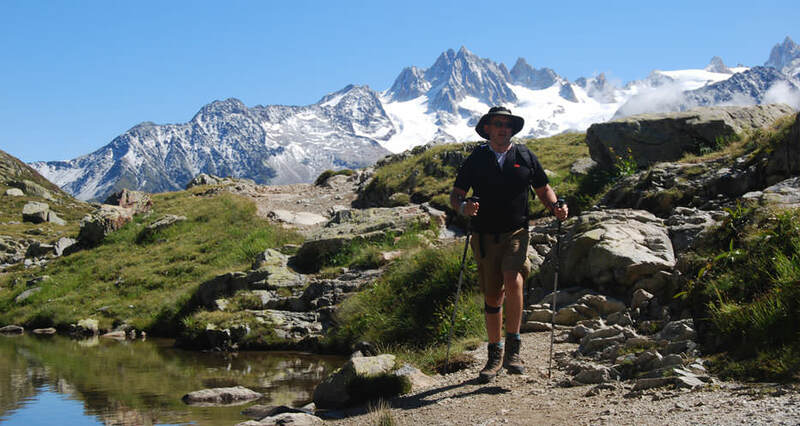 The TMB trek circles the Mont Blanc massif, starting and ending at the historic Chamonix valley, located at the base of Mont Blanc in the French Alps. The tour extends from France through Italy and Switzerland on its route to Mont Blanc. The trail hikes is around 165 km, with around 10,000m of ascent and descent. The highest point reached on the regular Tour du Mont Blanc is 2532m at the Grand Col Ferret; it marks the boundary between Switzerland and Italy. The other key passes are the Col du Bonhomme (2479m), Col de la Seigne (2516m) and Col de Balme (2191m). There are plenty of alternative routes, or variants, on the Tour du Mont Blanc. These are often quieter and may offer more challenging trekking. Two of these take you to higher altitude: the Col des Fours (2665m) which lies between the Col du Bonhomme and La Ville des Glaciers and the Fenetre d’Arpette (2665m). Both of these are a bit tougher than the regular trail and you are better crossing these with an experienced mountain guide . Some hikers also like to spend a night at the Cabane d’Orny in Switzerland which is 2831m. We have 30 years of experience running adventure holidays worldwide. We specialise in running the Tour du Mont Blanc . All our guides are International Mountain Leaders. Call us on 01273 256753 for more details or send us an email here.